As a result, it was decided to ultimately phase out the dry sump system. Furthermore, once the planned 100 Essex cars were built, they would be replaced by a Turbo Esprit with more conventional colour schemes for the body, and one that would be more realistically priced. Consequently, in April 1981, when the Essex model was phased out, a new Turbo Esprit sports car, designated the Type 82, was launched in traditional colours, and with the price reduced. This was primarily due to the fact that air conditioning, which had been standard equipment on the Essex variant, was now offered as an optional extra. It is worth noting that, officially, both the Essex Turbo and the post 1981 Turbo Esprit were both classified as Type 82, although this designation was more widely associated with the latter model. The result was that demand for the Type 82 quickly increased, with production rising to 116 units in 1981, and 205 units in 1982. 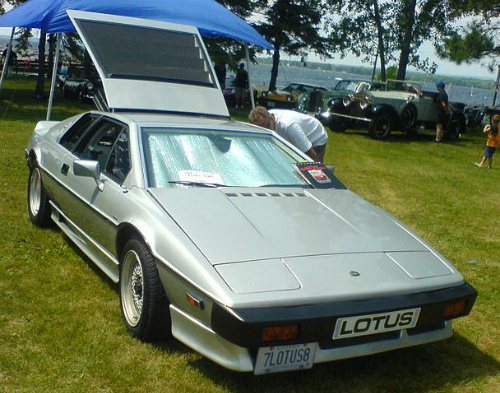 In fact, in 1982, the new Turbo Esprit was the fastest selling model in the Lotus range. From March 1983, all Turbo Esprits incorporated the traditional wet sump system of engine lubrication. In 1983, 343 units of the new model were built, which rose to 418 units by the end of 1984. In 1984, the Type 82 was improved by the enlarging the boot area, and by the addition of a removable glass panel sunroof, regarded as ideal in areas such as California. An interesting feature of the cars built after late 1984 was the fact that the Turbo chassis was now available with an 8 year anti corrosion warranty as standard. Until March 1986, with the introduction of the High Compression variant, there would be no further important changes to the Turbo. An interesting variant of the factory produced Turbo was the model prepared by Bell and Colvill, a notable UK based Lotus dealer. In 1978, they offered their own privately funded turbocharged conversion, based on the 1974 cc, Esprit Series 2. It used a large, single SU carburettor, linked to the AiResearch Garrett T3 turbocharger, and with the compression reduced to 7.5:1 by using different pistons. It developed 210 bhp at 6000 rpm, and 202 ft/lbs of torque. It claimed a top speed of 150 mph+, a 0-60 mph time of 6.2 secs, and a 0-100 mph time of 17.2 secs. The only external distinguishing feature was the addition of "Turbo" emblems close to the factory's own "Esprit" logos. In April 1981, the new Turbo Esprit returned to the more widely used wet sump system of engine lubrication, whilst still maintaining the same power and torque as the dry sump Essex Turbo variant. The interior was modified to include new trim, an increase in headroom, and a larger footwell. Externally, the new model retained the same body styling as the Essex, together with "Turbo Esprit" emblems positioned on the front of the bonnet, and on the sides, and with 15 inch BBS alloy wheels. In 1985, there were slight alterations to the bodywork and the front suspension. A 1981-84 Lotus Esprit Turbo Type 82 in excellent condition would command in the region of £40,000/$65,000.